Datamark offer non-adhesive tags which are used for a wide range of purposes, including retail price tags, cage cards and ‘work in progress’ control. 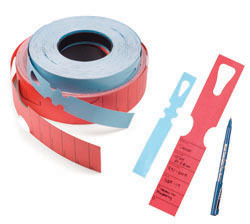 At Datamark UK we produce and print non-adhesive tags and swing tickets in rolls on thermal transfer and direct thermal material, plain and printed, in a wide range of shapes and sizes. Datamark offer some stock tool sizes and can originate new designs which can be overprinted using your own artwork, designs and information. As well as punch holes we offer the inclusion of slots, perforations, along with tear-off portions and provision for print on both sides including colour coding. 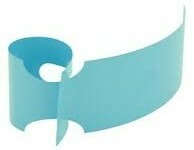 The finished product is supplied in rolls, fanfolded and can be overprinted by thermal transfer, laser and other methods. For further details give us a call at +44 (0)1482 506560 or(0)1482 505101 or e-mail us using the box to the left for free helpful assistance.